Parts: 1. Development: Concept and Structure. The Concept of Development (P. van Geert). The Structure of Developmental Theories (P. van Geert). 2. Causes and Conditions of Developmental Change. Learning and Models of Development (M. Atkinson). Developmental Contingency Modelling - A Framework for Discussing the Processes of Change and the Consequence of Deficiency (J. Morton). Theories about the Causes of Cognitive Development (P. Bryant). 3. The Social Dimension of Development. The Conditions of Human Development - Implications of Socialization Research for Developmental Theory (D. Geulen). Development and Social Expectations (P. Vedder). 4. Three Views on the Nature of Developmental Processes. Cognitive Change and Behaviour (F. Orsini-Bouichou and J.-L. Paour). Developmental Sequences - Some Characteristics and an Empirical Demonstration (J. ter Laak). Psychic Development of the Individual - A Process of Structuring and Restructuring Experience (M. Tyszkowa). 5. Rationalism Versus Empiricism in Developmental Theory Building. Children's Theories and Developmental Theory (E. Elbers). Getting Development off the Ground - Modularity and the Infant's Perception of Causality (A. Leslie). On What is Cognitive about Development (B. de Gelder). Discussing (from various viewpoints) problems in theory building and theory evaluation, this book starts from the assumption that theories of development are particular ways of defining the concept of psychological development in terms of a specific conceptual framework, as well as in terms of a specific empirical range (nature of the explained phenomena, prototypical experiments and applications, etc.). 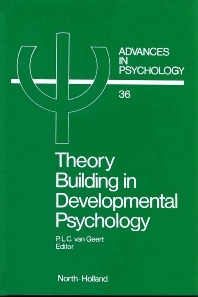 The first three parts deal with basic problems in modern developmental psychology, namely ways of describing development and how they direct theory formation; causes and conditions of development in relation with learning and the problem of precursors; and the individual and the socio-cultural dimension in theory building. The fourth part demonstrates three different forms of theory building, while the final part deals with an old philosophical problem in developmental psychology, the rationalism-empiricism controversy.